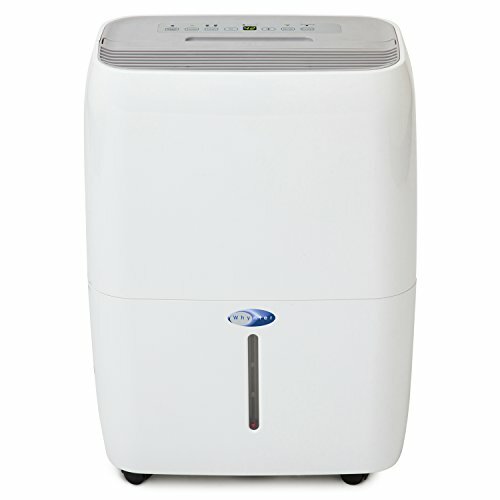 Maintain a comfortable humidity level in your home or office with the Energy Star qualified Whynter Energy Star 40 Pint Portable Dehumidifier. The Whynter RPD-411WG has the capability of removing up to 40 pints of moisture from the air over a 24 hour period. The compact Whynter RPD-411WG is specifically devised for small spaces while retaining an emphasis on designer styling for the most discerning users. Features include a water indicator alert with automatic shut-off which lets you know when the 10 pint tank is full, auto-restart feature which saves your settings during a power outage and auto-defrosting capability to prevent frost build-up. It also features a continuous draining option available with a drain hose. This portable dehumidifier offers a removable, easy to clean 2-in-1 silver-coated washable pre-filter, heavy duty caster wheels and sturdy concealed handle allow for this portable dehumidifier to be easily moved from room to room. Built for large capacity usage, this unit is suited for use in enclosed areas up to 2500 sq. ft. Features: 40 pint (18.9 liter) capacity dehumidifier; 10 pint (4.73 liter) removable water bucket; Auto-restart and Auto-shutoff functions; Adjustable humidity range of 35 - 85% relative humidity; Low temperature operation (minimum ambient temperature low 40 Degrees); Auto-defrosting capability to prevent frost build-up inside unit; Electronic controls with humidity sensor settings; Direct drain option for continuous operation; Runs quiet with normal operating noise level below 50 dBA; Dual fan speeds and 24 timer function; 2 in 1 silver-coated washable pre-filter combo included; Handles and caster wheels for portability; Non ozone-depleting refrigerant: R410a; 20" drain hose included for gravity drainage; Air Flow (at high speed): 180 m3/h/105CFM; Power Supply: 115 V/60 Hz; Unit Dimensions: 15.25"W x 9.25"D x 22.25"H (19.5" in H when casters are not installed); UL listed and Energy Star rated.